Next week, I am hoping to start preschool with my boys. We have an awesome program that lends learning materials and toys for free and has materials you can use for a minimal fee. I think I am going to take them there Tuesday and let them pick out a theme/unit. Then, we can go to the library and find books on that theme. I can design the rest of the week's learning experiences around what they pick out. I really hope this works! Craft-wise: I am hoping to get some more crocheting done while out of town this weekend. 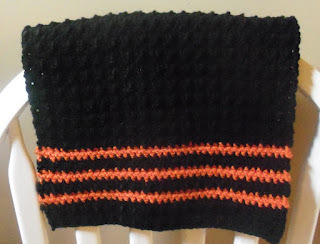 I'm thinking some orange and black washcloths and an orange dishcloth/kitchen towel with black stripes. I cut out squares of fall fabric to make my first hand-sewn table runner, but you'll have to wait until Wenesday to see how that's coming. If you would like to see the listing for it on Etsy, click here. I would love to see what you have finished this week-post a link in the comments section! Great idea for a Friday post. It's so hard to finish handmade projects sometimes.